It may seem odd, but even in the month of January you may have to worry about a sinus headache brought on by rain. It is raining as I write this here in Ohio. The change in barometric pressure that happens with a storm like this can wreak havoc with your head and cause dizziness and headaches. Using a large towel, bend over the bowl and keep yourself and the bowl completely covered. The goal is to keep the steam trapped in while you breathe in the anti-inflammatory benefits of the herbs. The warm steam will soothe your irritated sinus passages, relieving your headache. Try to stay in your steam tent for at least eight minutes. If you are suffering with congestion keep a tissue handy for the inevitable release of mucus. If your sinus suffering is coming from excessive dryness, you may also wish to add a pinch of marshmallow leaf (Althaea officinalis) for lubrication. You may want to repeat this another time during the day if you don’t get relief from your headache right away. Add a drop or two of lavender essential oil to a wet washcloth. Seal it in a ziplock bag and put it in the fridge for at least an hour to chill. When placed over the eyes and temples this is very soothing. I never use a chilled washcloth for a headache without adding a nice footbath. You’ll need a small tub or basin for this. We have found inexpensive kitty litter pans are the perfect size. Fill the basin with very warm water. It should be as warm as you can possibly stand. Add a handful of the herbs you have available. I especially like hops (Humulus lupulus), but you might try some lavender (Lavendula angustifolia) or even some basil (Ocimum basilicum) out of your spice cabinet! Want to open your sinus passages quickly? A heaping spoonful of fresh horseradish is just the ticket. This one may be difficult for some, but I love horseradish! If your sinus headache is due to congestion honey is a perfect, if sticky, solution. Spread a bit over the sinus cavities both over your eyes, on your forehead, as well as under your eyes. 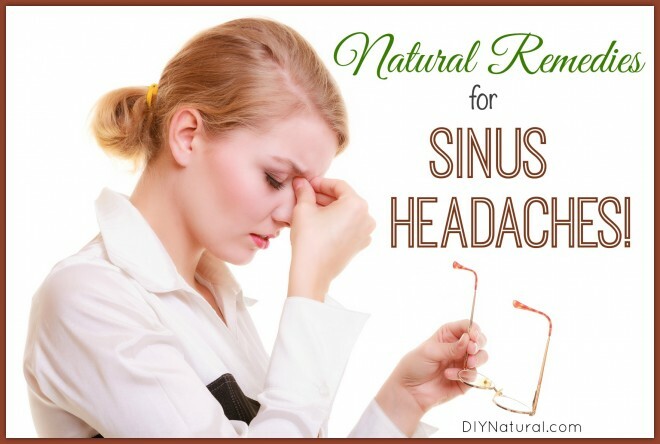 You’ll be surprised how quickly your sinuses will begin to drain, providing relief. Do you have a favorite headache remedy? Share yours in the comments section below! Acetic acid is not the optimal substance for change of nasal microbiome. It is more suitable to use probiotics (acidophilus bacteria). A dose of “good” bacteria could solve your sinus problems. microbiome, “nasal microbiome”, “oral microbiome”, “snorting probiotics”, “chewing probiotics” etc. Something a chiropractor told me years ago that worked wonders when I had a severe sinus infection was, empty a nose sprayer of its contents, rinse and add about 5 drops of vinegar (I used cider vinegar). Fill the sprayer with filtered or distilled water, shake. Spray your nostrils. It doesn’t burn and it started helping me the very first time I sprayed it. He told me that so often a Dr. will recommend saline for these issues and he said the worst thing you can do is use saline when your sinuses are infected or clogged or . . . The reason is that when your sinuses are running or clogged or whatever, the acid in them has been stripped out from all the running, blowing, etc.. By spraying acid in through vinegar water helps to balance your sinus’s out again. I know it worked wonders on my infected, bleeding sinuses and a lot of others who I’ve shared this with over the years that had severe allergies and clogged sinus’s and all different sinus issues. It never burned at all and my sinus’s were bleeding so I know they were raw inside. I didn’t have a nose spray bottle so I went to the store and bought a spray bottle with saline in it (it was the cheapest thing I could find) and dumped it out and used that. He said you could do it as 4 or 5 times a day or more that it wouldn’t hurt you and it sure does help!!! Thanks so much for the vinegar idea Lorene! And for adding the tip on buying a saline filled bottle to empty. That is something I will definitely try next time. The above tips seemed more for sinus headaches than the infection itself, and since I don’t get the headaches, your tip was perfect!